Week 4 | Whole Food. Real Food. Good Food. Week 4: We started carrying water bottles with us everywhere. Even if they are BPA-free, plastic water bottles are still made of chemicals, which could potentially cause health problems. 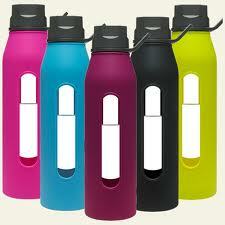 Another type of water bottle we use and love are Takeya Glass Water Bottles with Silicone Sleeves. 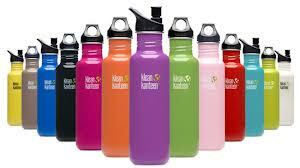 These are great if you like a dishwasher safe bottle — the stainless Klean Kanteen bottles are dishwasher safe, but the company recommends hand washing the ones that are colored. The Takeya Classic Water Bottle features a high quality glass bottle with a wide mouth, and is encapsulated by a silicone jacket that provides a nice grip, as well as protection for the bottle. The sleeve has a see-through window for checking the liquid level. The twist-off cap is airtight and includes an easy carry loop. This H2O bottle provides healthier way to drink, and eliminates metallic or plastic tastes, and leaching from toxic plastics. People often ask me if the bottle is breakable when they see me with it. I actually tested the bottle when I first purchased it by dropping it on asphalt — it did not break! The silicone jacket really does protect the bottle. The following tips will help you ensure that you drink enough water each day and avoid the disastrous effects of dehydration described above. Every day, aim to drink as many ounces of water as half of your body weight in pounds. If you’re currently drinking much less water than this, increase your intake gradually. Although dehydration can significantly compromise your health, drinking poor quality water poses serious risks as well. Be sure to drink high quality filtered water. 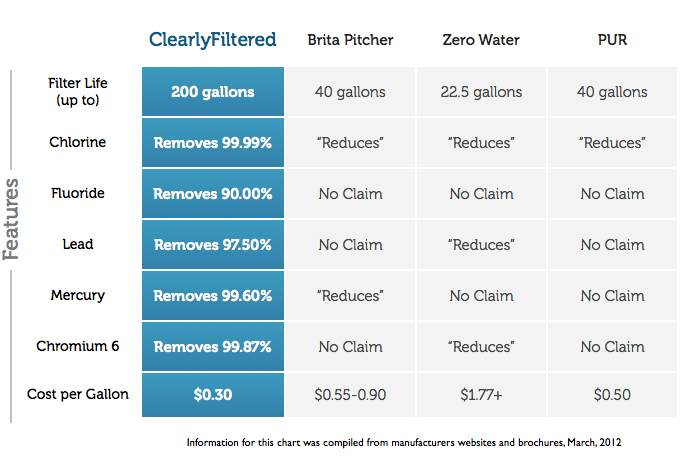 The Clearly Filtered Clean Water Pitcher has the most advanced filtration available for the price, with a patented anti-flouride technology. 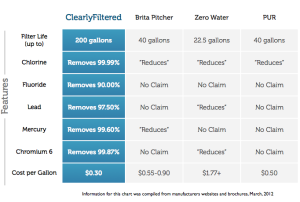 Click here to find the water filter that will work best for you. Use the following schedule to achieve your daily water intake requirements in optimal fashion. Drink a glass of water immediately upon waking up in the morning. This will help to replace the water lost during sleep. Drink a glass of water a half hour to 15 minutes prior to each meal. This will help to restore the water used by digestion. Drink a glass of water between 1 and 2 hours after a meal. Drinking water too soon after a meal will dilute stomach acid and interfere with digestion. Because a cell’s ability to absorb water is dependent on salt, it’s one of the most essential nutrients to good health (see how we revamped salt in Week 5 of my Getting Started section). As such, it’s often beneficial to add a pinch of salt to your drinking water, but be sure to use good quality salt (i.e. Himalayan Pink Salt) instead of refined table salt. If you drink water that is filtered by reverse osmosis, the sea salt will also reduce the acidity of the water and replace lost minerals and trace elements. Because alcohol suppresses vasopressin, the hormone that facilitates water absorption by cells, it is best to limit its consumption. Furthermore, because alcohol is a toxin, additional water is drawn from the body to process and eliminate it.